There may be several reasons for redirecting or forwarding a call. 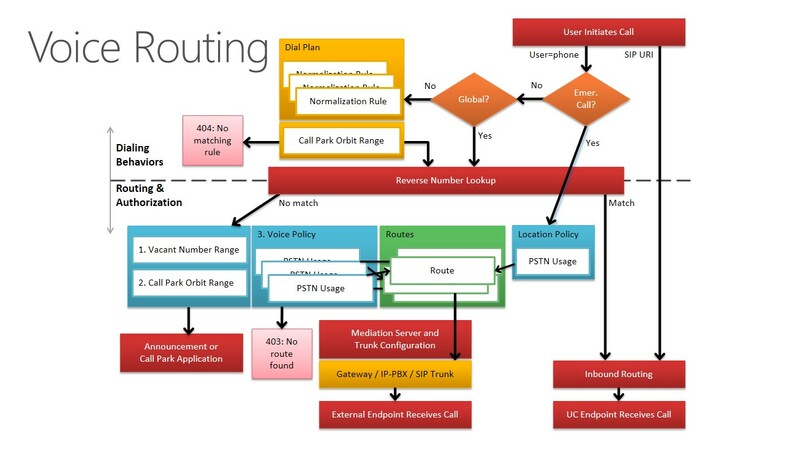 In Lync phone numbers are not separate entities like the case is with other PBX systems, such as in Cisco UCM. A phone number only exists whenever assigned to a user or endpoint, so how would you go about redirecting it? So now that we have some use cases for redirecting or forwarding the calls, lets look into how to achieve this. Creating a dummy Agent Group, Queue and Response Group that will handle incoming calls to the number assigned to the Response Group. The RGS object can in turn be set up to forward all calls. Although no additional licenses are required with this solution, it is still an impractical solution requiring several “dummy” objects not really doing anything. Using an Unassigned Number Range along with an Announcement Service, which is capable of doing Call Forwarding as well as prompting the caller through a sound file or Text-To-Speech. The third one is the preferred option, and the one I will focus on.This solution takes two steps to complete; first you need to create an Announcement, which is the prompt and the action that will be taken for the call handed over to it, then you will need to create an Unassigned Number range that will “catch” the number (range) in question. Creating an Announcement can only be achieved from the Lync Server Management Shell, using Powershell commandlets. The Identity of your Application server. This is your Front End Pool. The voice announcement you would like to have. This can either be a previously uploaded voice prompt or using Text-To-Speech (TTS), in which case you will also need to add the -Language parameter. Or, it could also be left blank. The forwarding destination, which can be a SIP URI or a phone number. This can also be left blank if you simply want to terminate the call. New-CsAnnouncement -Name "Unassigned number" -Identity ApplicationServer:your.pool.fqdn -TextToSpeechPrompt "You have reached an unassigned number. Your call will be forwarded to the switchboard" -Language "en-US" -TargetUri "sip:switchboard@yourdomain.com"
If you’d rather have the call forwarded to a phone number, simply change the TargetUri value to "sip:<E.164number>@yourdomain.com;user=phone". The third alternative is to forward to a user’s voice mail, where you simply append "opaque=app:voicemail" to the users SIP address, e.g. : "sip:user@yourdomain.com;opaque=app:voicemail" in the TargetUri field. Once you have your announcement ready move on to defining the Unassigned Number Range, which can be as the name indicates a whole range of numbers (even including those in use by your organisation) or just a single one. This operation can be done both through Control Panel or PowerShell. The first one needs little or no explanation, and since we’re already doing things in Lync Management Shell, let’s continue doing that. The Identity of your range. Simply a tag making it unique. The Starting Number in the Range. The Ending Number in the Range. If just a single number is what you want, simply make this the same as the previous. The Identity of your Announcement service. Basically the same as the -Identity parameter under New-CsAnnouncement. The name of the specific Announcement you want to assign. New-CsUnAssignedNumber -Identity "Undef1" -NumberRangeStart "tel:<E.164number>" -NumberRangeEnd "tel:<E.164number> -AnnouncementService ApplicationServer:your.pool.fqdn -Announcement "Unassigned number"
An alternative to using the previous announcement is utilizing an Exhange UM Auto Attendant, provided you have one set up. In that case, simply replace the AnnouncementService and Announcement parameters With -ExUmAutoAttendantPhoneNumber and the number for it. The Lync server will run a Reverse Number Lookup on all calls, trying to match it with a user homed in it’s pool. If no match is found then it will continue looking at Unassigned Number ranges, and if the called number should fall within such a range, then the call will be handled according to the Announcement or EXUM AA parameter. First a little something to remember: If you insist on using Lync Server Control Panel whenever possible, just make sure you create the Announcement before you even open LSCP. It has this thing of caching stuff from when it starts up, so that a freshly defined Announcement might not show up in LSCP during Unassigned Number setup, and you have to exit and reopen LSCP. So, having set up Announcement and Unassigned Number range you might, as I did, realise that it does not work. Like I mentioned initially, my goal was to forward the call off Lync’s territory and onto a PBX system. Incoming calls to my single number “range” got the TTS prompt, but then simply disconnected. At this point I tried altering the Announcement, trying a SIP address instead of a phone number – and found it to be working. This is where you have narrowed the problem down to a Routing or Authorization issue. The first thing to look for is whether Call Forwarding is working at all, that is; for your regular users. Although enabled by default, call forwarding can be disabled through policy. Also, settings regarding SIP Refer support on the trunk can lead to problems related to forwarding since it has to do with call handling between the connected systems. Check with your service provider or the one responsible for any PBX you are connecting to if you are uncertain of what the settings should be like. In my case, my Lync account was able to transfer and forward calls off of Lync, and Refer settings on the trunk were correct as well. After having completed some test calls, simply run the above command, replacing Start- With Stop-. The Search- cmdlet takes parameters for StartTime and EndTime, and in a large organisation it might be useful to limit the scope this way – by default it will output the last half hour or so, and that might give you a really large file to parse through. Although it is possible to filter by Phone (number) and URI, I often leave those out and rather do the filtering when parsing the file in Snooper. From the error message, the cause is really clear about why it is not working. I have highlighted the relevant parts, stating the SIP 403 response along With the more verbose “Reason” field. It seemed like the user policy did not offer a “phone route usage”. What is a “phone route usage”? What user and policy is this referring to? The first one, although listed as a single entity, refers to both PSTN Usage and Voice Route – two fundamental parts of Lync Enterprise Voice. In short, a Voice Route holds a number pattern that the destination number needs to fall within and if so which gateway the call will go to. The PSTN Usage will simply tie one or more routes to the Voice Policy of the user in question. So, to the next question, what user is this referring to? The answer is also given in the previous error message: useruri=sip:RtcApplication-576d820d-009e-4932-a1d2-4308fd5e467e@yourdomain.com. This is not your regular user, but rather the endpoint assosciated With your Announcement service – automatically created by Lync and normally you would never have to relate to it, as it works silently under the hood. But since we now have problems related to this “user” (or endpoint) and it’s assosciated user policy, we need to dig a little more into this. As you can tell by the output, there is no Voice Policy assigned to the endpoint. This is not uncommon, as it will automatically be assigned a Site or Global Voice policy if no User Scope policy is specifically designated. In most cases this will work just fine, as some administrators might want to use the Site or Global policies for their voice enabled users. In my case I wanted all users enabled for Voice to be explicitly assigned a policy stating what “calling permissions” the user had, and therefore the Global (no Site policy in my case) policy did not contain any PSTN Usages. To solve this I could simply have changed the Global policy to include a PSTN Usage pointing to a valid Voice Route that would accept the number I was forwarding to. This would unfortunately also allow any user enabled for Enterprise Voice and not assigned a User Scope policy the right to call numbers they might not be authorized for. 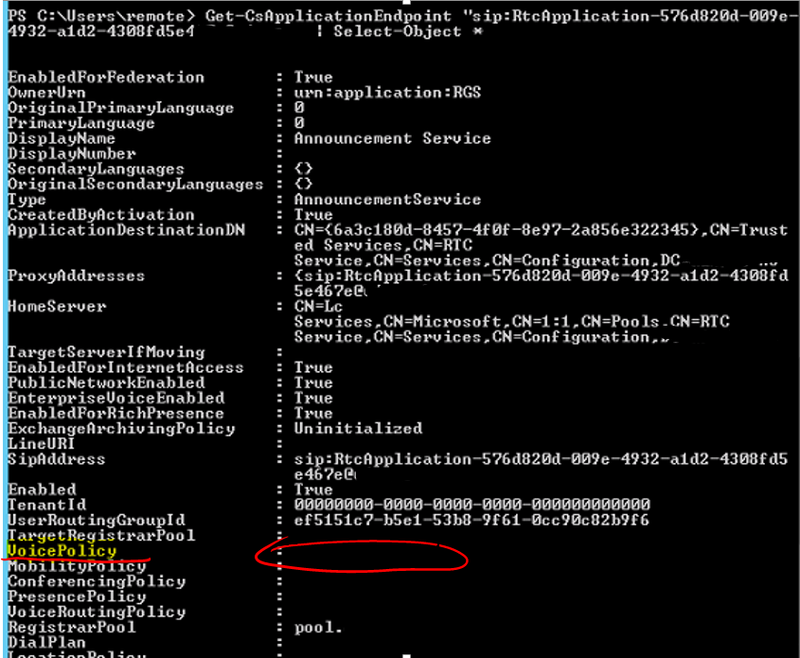 Get-CsApplicationEndpoint "sip:RtcApplication-576d820d-009e-4932-a1d2-4308fd5e467e@yourdomain.com" | Grant-CsVoicePolicy -PolicyName "User - Limited"
As you can tell, the endpoint that handles the Announcement service now does contain a Voice policy (text in Norwegian, “Begrenset” translates to “Limited”) and should be able to do the same Things that a regular User having the same Policy. Test whether changing the TargetUri to an internal SIP address makes a difference – it should. Posted on August 31, 2013 by Rune Stoknes. This entry was posted in Lync Server 2010, Lync Server 2013 and tagged Call forwarding, Lync, PSTN. Bookmark the permalink. amazing blog Sir. Helped a lot! Great blog though I ran into an issue using unassigned number for call forwarding to an external number. The problem appears to be you don’t get a referred by or history header on a call forwarded from an unassigned number range. This means the outgoing call to your provider goes out with the original calling number and no identifier to build something like a diversion header into you outgoing SIP invite. In my case my provider then rejected the calls as they don’t originate from a number that can make outbound calls on the SIP trunk. Setting the voice policy on the application end point to a policy that specifies a trunk enabled to send call history has no impact. So I think if you need to forward to an external number the SEFAUtil method is probably going to be a better option.